Currently I use WMC for live tv and dvr functions. I have my WMC recorded tv folder shared through Mediabrowser server so that I can access this on the Roku, however since these aren't named appropriately and there is no folder structure there is no real organization to it when browsing in the Roku. It lists all episodes individually without any real description so its a bit cumbersome to know which episode is which. Right now on my HTPC for WMC I have a button mapped on my remote to access the recorded tv menu and this function needs to remain (WAF). As far as I know the WMC recorded tv folder only recognizes individual WTV files, so I can't setup a folder structure within that folder and still see all the recordings within WMC. I'm trying to figure out the best way to have this organized for the Roku, but keep the ability to hit a button on the remote to go directly to recorded tv on my main HTPC. Anyone have any suggestions on the best way to go about doing this? Edited by christoph86, 01 February 2014 - 03:22 PM. I'd suggest one of those TV renamer programs. I've never done it personally, but I know there are a few out there that will actually take your WTV files and organize them. I'd have it copy the files if possible and put it into a new directory with the proper TV organization intact. Then point MB to that folder instead of the default recorded tv folder. Like I said never done this personally, so not sure if it would work, but I think it would. Yeah its handy. Although sometimes the guide data for certain shows doesn't produce the episode name! I haven't got round to trying another EPG provider yet which may help. WTV Metarenamer and MCE Buddy are the two most widely used of these apps. But neither of them is usable for me. Metarenamer seems to be better at reading the WTV metadata but it will not work with movies, only TV shows. MCE Buddy recognizes movies but is not as good at finding matches. It cannot be told to ignore incomplete matches and it cannot move files to a different drive, so if you set it to monitor your recorded tv folder all it will do is rename/move to a subfolder structure. It is really aimed at converting to more space efficient formats, not organization. - if no match, ignore or move to user specified "catchall" folder. Depending on the sources of EPG data, WTV metadata can look different, so it would be good to be able to specify matching criteria. E.g. because WTV metadata does not have a season/episode tag, I have my XMLTV grabber insert "Season X, Episode Y" into the EPG subtitle field, so the WTV metadata will read e.g. "Seinfeld" as title, "Season 4, Episode 12 - The Airport" as subtitle. This can't be too hard, can it? Unfortunately I am not a dev so hopefully someone who is could look at this? Edited by politby, 02 February 2014 - 04:25 AM. Thanks guys. I don't think I trust myself on the registry changes, but I think I will give the WTV renamer a try. Seems like it should do what I need. Worked perfectly for the occasional Live TV program...thanks! I need to leave my Recorded TV in same folder so that it autodeletes (like daily show) that I don't want to store in my long term media storage. Setup your folders as subfolders in the recording tv folder. That's what I did. This way you can access the shows thru the wmc recorded tv screen, mb, and any mb apps like the roku or web browser. I use mcebuddy to automatically rename and move each recording as soon as wmc stops recording it. I'll post the mcebuddy settings if you need them. It works like a charm. Edited by politby, 04 February 2014 - 02:28 AM. If you could post those settings that would be great. I've used mce buddy some for kids movies to cut out some commercials so I'm familiar with it. I tried using MCE buddy to automatically rename the wtv file, which it does. I have my settings to change to WTV unprocessed with no commercial cutting, however after it is done the file does not play getting a decoder not found. The original plays fine, so I'm not sure what setting you are using in MCE buddy to just rename the file without any conversion taking place. I think my setup is what you are saying doesn't work. I have WTV files that get processed through MCE Buddy (comskip and compressed WTV). Those are then dropped out on a shared recorded tv folder that MB watches as well as WMC. I have the Series\Season\Episode file structure that MB likes and that makes it playable on the Roku. WMC is able to find it as well because it's in the Recorded TV folder on the server. In my case, MCE Buddy deletes the original. But there's an option to keep it synced as well, so I think that means two copies (one for WMC and one for MB) and when one gets deleted, so does the other. I am new to this setup w/the folder structure, so over time, I may have cleanup to do. But I'd think a simple addin that could walk the TV folders and delete those w/o video content would take care of that; it may even exist already. Thanks for the help I have it setup like this now but clicked the rename only option since the other way was not working. It makes a copy, but I am going to change it to delete the original now that it seems to doing the job. Works great right now for wmc and the roku. Looking at your files, I see that you are telling MCE Buddy exactly which file name patterns to look for, that's why it works for you. I don't want to have to go in and edit the configuration every time I add a series recording, I want it to monitor every new recording, look for a match, if it finds one move/rename to "Recorded TV\sorted", if no match ignore. Set and forget. When I try to set it up like that, it renames EVERYTHING and incomplete matches end up in folders named just "Season" without appropriately named parent folders. and for good measure I have set the recording file name format to contain all the relevant information, e.g. "Criminal Minds-Season 2, Episode 23 - No Way Out.wtv" but MCE Buddy still has problems finding matches. If you’re not using the Match Filters settings, MCEBuddy is doing what is supposed to do, process all WTV files. I don’t know any solution or metadata manager that will do exactly what you want. I don’t mind adding the correct name or TVDB ID in the configuration for each new show once, that I want MCEBuddy to process correctly. To me, it’s no different when adding new movies and tv series in MB3 collection. I provided the exact TMDB movie name or TVDB tv series name, MB3 fetches the correct metadata with no issues. 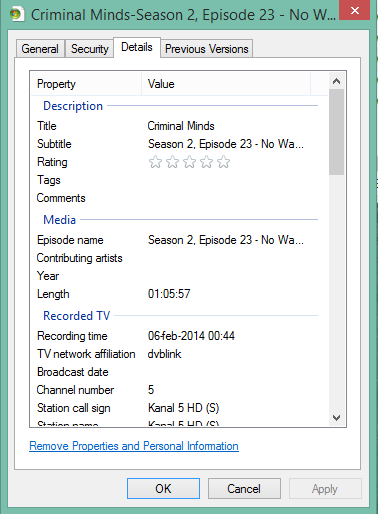 If I don’t provide the correct TVDB name, shows such as Castle (2009) or Shameless (US) will have the wrong metadata.